We’re getting excited here at DepicT! HQ as there are only a few weeks left until this year’s submission deadline (Mon 3 July – but you knew that already, right?). DepicT! is Watershed’s free competition for tiny films and each year we’re inundated with fantastic entries from around the world, all 90 seconds long or less. Submissions span every genre and style of filmmaking and come from people at all levels in their careers (or hobbies). We remain immensely proud of the filmmakers who have entered and found their way onto every year’s shortlist, and subsequently go on to do amazing things – we also love staying in touch with them and finding out what they’re getting up to now. Lee Charlish won the DepicT! 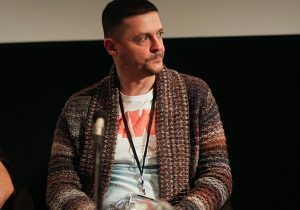 British Special Mention Award last year with his abstract animation, Pig Dream. Upon giving him a package of career development opportunities the judges said his short contained “powerful images and compelling sense of the horrific” – it’s also really, really good. We caught up with Lee to chat about making his winning film and advice for anyone applying for this year’s competition. Pig Dream was an amalgamation of fractured dreams weaved together to form some kind of abstract message. It was about mental illness, particularly schizophrenia. I built the narrative from heightened ideas, gathered from various dreams and daydreams, and put it all together to try a make some kind of cohesive message. I have an over active imagination! Even if you don’t truly get it, the film should still be enjoyable in some way. That was my point. What drew you to the DepicT! 90 second format? I was already aware of the DepicT! Competition and 90 seconds provided me with the discipline to focus attention and pacing, and decide what would be more impactful. The film was supposed to be abstract and visually striking, and relied less on a solid hook from a narrative. So, 90 seconds lent itself well to what I was trying to achieve. Attention spans are dipping as everything is more immediate these days – capturing an audience and captivating them is a challenge. This format helps. Obviously, animation is a painstaking process and, despite not being a purist, as such, there were techniques employed in the creative process which meant that a significantly longer film with the same aesthetic would be difficult. How did you find the making of your DepicT! film? It was predominantly animated using real, photographic elements and Photoshop manipulations, so it presented lots of challenges when trying to achieve the aesthetic I was after. Did I achieve it? Probably not completely. The result was satisfying and obviously it realised its ambitions somewhat. However, with the passing of time, a little more knowledge and experience, I could and would make the same film better and differently now. All in all, it was a great experience, despite feeling like I was snorkeling through glue with it sometimes! What was your level of experience before submitting to DepicT!? I’d make some films since the advent of the noughties, but left it all behind in about 2008, until 2014 when I made a six minute animation. I’m completely self-taught and always had it in my mind to enter something snappy into DepicT! with its 90 second format. Animation is less restrictive, both financially and practically, on what you can achieve, in terms of locations and characters. Essentially, worlds can be created with the only limit being your imagination. However, there is a naiveté to my thinking, I’ve since realized. Animation is tough and painstaking, so yes, the autonomy it offers and the ability to create all manner of set ups and worlds is possible, but it’s hard work and the preparation process is long and drawn out. I am never short of ideas! I’m a frustrated writer and actor! My website korkyfilms.com contains all the projects I am currently involved with and my enthusiasm to make more films has only increased since the DepicT! success. My latest animation, ninetofive, is currently being finished and I will be entering it into festivals worldwide, including Encounters. I like the fact that with each project it feels like I’m improving. I always feel like my next film is going to be the best film and there’s something pleasing, if not a little frustrating, about wanting to get on with my next project whilst I’m working on the current one. I definitely have a love for creativity and filmmaking is my passion. Since my success I have attended the National Film and Television School (NFTS), as part of my prize, to learn about operating a camera effectively, so I’m hoping to get more proficient with self-shooting a live-action short in the near future. However, I will still animate, despite feeling like I could jab myself in the eye with a pencil in frustration sometimes! Can you sum up why DepicT! is important to emerging filmmakers? It’s a respected and recognised platform to get good industry exposure and a means of getting your film shown to a receptive audience. My experience at Encounters was amazing. Great organization and a positive vibe about the whole event. People are supportive and they WANT to watch your films. Since receiving my award I have had additional training and mentoring as part of my prize which is invaluable. What would be your top three tips for this year’s DepicT! entrants? 1) Ignore elaborate concepts and keep the idea or message simple, or abstract enough to captivate an audience. 2) Don’t stop yourself from entering. If you think you can, you should and then you will. 3) Learn from the mistakes of others who give you advice. Check out Lee’s winning DepicT! film here…. DepicT! ’17 is open for entries until Mon 3 July 2017. We accept films from people at any level in their career or education, from anywhere around the world, and in any genre. Our only rule is that it has to be 90 seconds long or less. There’s up to £2,500 in prize money to be won plus loads of development opportunities, including mentoring from industry professionals and invaluable exposure at Encounters Short Film and Animation Festival. Good luck! Posted on 14 Jun 2017 at 3:51 pm.